Abstract: YouTube is just over 10 years old, and alongside its growth, we’ve witnessed the growth of a wholly new publishing form. Even more so than the video camera, online platforms like YouTube have made video interactions everyday. Once a rarified medium requiring professional equipment and expensive distribution means, publishing video to a global audience is now well and truly an ordinary activity. And increasingly, it is an activity that invites conversation rather than mere broadcast. The rapid rise and incredible ordinariness of online video has helped redraw our understanding of what it means to be a successful “broadcaster.” Industrial practices for creation and measurement have been turned on their head. Who an audience is and what their role should be have shifted thanks to “new” expectations about participation and the possibility of connecting with very large or very tiny groups of people. 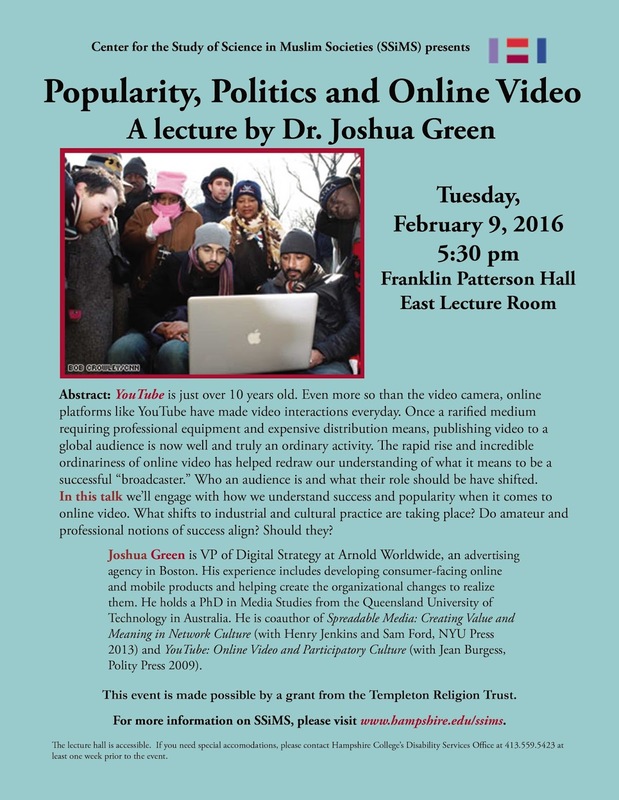 In this talk we’ll engage with how we understand success and popularity when it comes to online video? What shifts to industrial and cultural practice are taking place? Do amateur and professional notions of success align? Should they? Bio: Joshua Green is VP of Digital Strategy at Arnold Worldwide, an advertising agency in Boston, MA. His experience includes developing consumer-facing online and mobile products and helping create the organizational changes to realize them. He holds a PhD in Media Studies from the Queensland University of Technology in Australia. 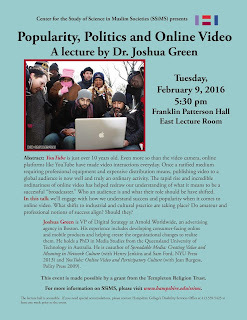 He is coauthor of Spreadable Media: Creating Value and Meaning in Network Culture (with Henry Jenkins and Sam Ford, NYU Press 2013) and YouTube: Online Video and Participatory Culture (with Jean Burgess, Polity Press 2009). This event is made possible by a grant from the Templeton Religion Trust. For more information on SSiMS, please visit www.hampshire.edu/ssims/. SSiMS recently released the Science and Islam Video Portal with evaluations of videos. The lecture hall is accessible. If you need special accommodations, please contact Hampshire College’s Disability Services Office, 413.559.5423 at least one week prior to the event.